Daniel arrived back in town this weekend, much to the joy of myself and one bearded compatriot. No, not Miyagi. We’ve got a lot of stuff on our plate right now, some of which you don’t know about, so it’s nice to have the team together yet again. Episode 13 should be out sometime this weekend, so stay tuned for that one. As I said before, it’s the first part of the series finale, and you’ll probably be mad about where it ends. Just saying. Episode 14 will be out hopefully around mid-August, depending on how things go. I’ve got some vacation time coming up this weekend and we’ve got those other unmentionables looming over us, so there are all kinds of things between now and then that could derail that particular train like a crane kick to the jaw. Let’s hope not, though. So, now that Season 2 (and the series) is almost over, what’s been your favorite episode of the second season? Go! 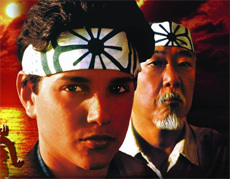 This entry was posted in News, TheLeetWorld and tagged karate kid, leet world season 2, miyagi on July 28, 2009 by Eddy. I’d have to say that it is a tie between the 3rd and 10th episodes. All of the episodes were very well done this season and the story line became addicting. However, the episodes that were the most fun to watch were the challenges. Its a shame there were only two, excluding the fight with Asher. This has definitely been a entertaining season to watch. My favourite episode, Wake Me Up Before You Go, period. my favorite, was episode twelve of season two. montrose yelling “fiddlesticks!” just took the cake. Yea, such a sad thing when its all over. sigh. will this website be close down? i hope not. Hmmm. my fav episode of season 2 eh? hmmm. should be 2.3 Trial by Inferno. epicly nice name as beautifully done. Lots a suspends in that one xD. Followed by 2.10 Wake me up before you go. This 2 episodes are truly nice. though i am sad that ahmad died. 1. Wake me up before you go. all episodes were great… not just great AWESOME ! hmm my favorite episode. i would have to go with episode 10, because of the legendary battle. That’s an easy one. No, the site will not close down. Well for sheer epicness it has to be Wake Me Up Before You Go.. But I quite liked Death’s Dungeon too, Episode 7 (forgot the name) which was the mid-season finale was pretty awesome too. I have a feeling all of these will be replaced by either Ep 13 or 14 (or are you going to do it 13 part 1 and 13 part 2?). Oh Mister Miagi, best update picture ever, heh. My personal favorite this season has to be “Wake Me Up Before You Go.” I feel that there was so much building up towards Asher finally making his move. And throughout the entire season, he was such a mysterious character, so it was really rather neat seeing him go haywire and use that turbo-charged cyborg power against the entire cast. I thought his incredible power was an outstanding way to draw Ahmad back to hax, and really didn’t expect Asher to get the last laugh by taking out Ahmad. I just saw it as a very good turning point for the season, and as a writer, I very much enjoy the dramatic turn about that came from the end of that episode. Epic. Wake Me Up Before You Go. The best episode, of the whole Leet World series. If this website EVER closes down, I will grab my AK47, come to Daniel’s house, and shoot him repeatedly in the face to get him to pursuade you all to start the website up again. Period. Welcome back Daniel! My favorite episode was Stranger in the House. It has that “Oh Snap!” moment at the end because you’re hoping Mendoza returns, but it’s just Asher trying to deceive everyone. Death’s Dungeon the best ep of se 2. Of season 2, definately ep 3 Trial by Inferno. Its so badass, and makes a big exeption compared to other fight scenes. Gotta be Wake Me Up Before You Go. I just didn’t see the dramatic impact of that episode coming at all. The way Ahmad’s brutal choice and ultimate sacrifice were framed was so well done, and it all hit home suprisingly hard. I think I was still stunned when I woke up the next morning. All of them, of course! How can you NOT enjoy an episode of The Leet World? progressively every episode gets better and better there is no real start to the best.